The Naval Act of 1794 permitted the construction of six frigates during time of conflict. The captains and ship yards got started, but the potential conflict on the horizon disappeared and according to the agreement, construction was supposed to stop too. Learning that he had to have force to ensure his country’s neutrality, President Washington convinced Congress to pass a bill in 1796 allowing the first three frigates to be finished. In 1798, in the midst of troubles with France, Congress finally approved the funds for three more frigates. Today’s blog post introduces the first six ships built specifically for the United States Navy and some of their famous moments in history. Designed by Joshua Humphreys, these ships were constructed to last and to be the best-built and fastest for their size. Although small than British ships-of-the-line, the maneuverability, speed, and armament of the American frigates would give the new navy a significant advantage in forthcoming combats. Built in Philadelphia under Humphrey’s watchful eye, United States was launched in 1797. At 175 feet in length, carrying between 400-600 for a crew, and boasting 55 guns, this ship was an impression “official” beginning for the U.S. Navy. The vessel played roles in the Quasi-War, War of 1812, Second Barbary War, action in the Pacific, and combat against the slave trade. 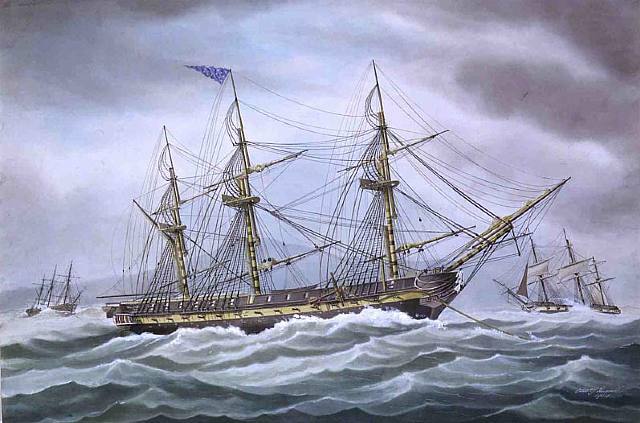 During the War of 1812, United States engaged and captured the HMS Macedonian, which became the first captured British warship to enter American ports. During 1842, United States successfully captured the bay city of Monterrey, California – mistakenly believing that war had been declared between Mexico and the U.S; they returned the port city and headed for Hawaii. United States was captured by the Confederacy during the Civil War, briefly used as a gun ship, and eventually sunk to obstruct a river. Constructed near Baltimore, Maryland, Constellation launched for the first time in 1797. One hundred sixty-four feet in length and carrying a minimum of 38 guns, this new frigate was built from ever-green oak and cedar and could carry over 300 men. She sailed and/or fought in the Quasi War, First & Second Barbary Wars, War of 1812, and circumnavigated the globe, protecting American trade interests globally through the first half of the 19th Century. 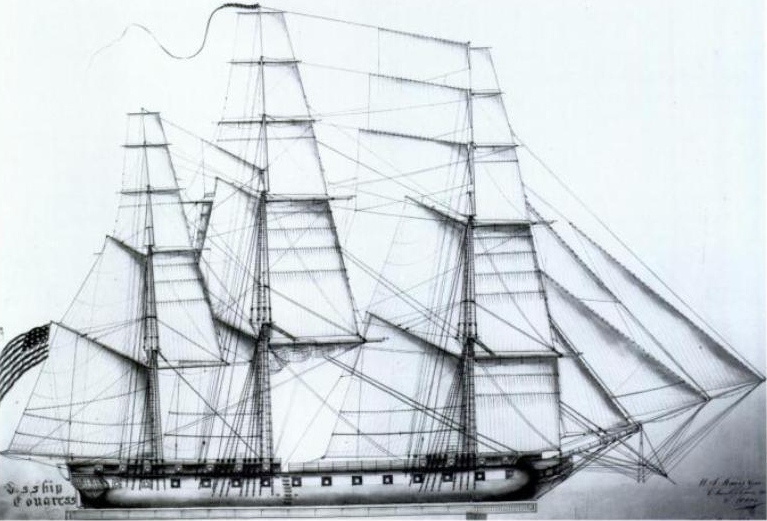 Constellation battled the French frigate L’Insurgente in 1799, resulting in the first major naval victory for a United States designed and built warship. 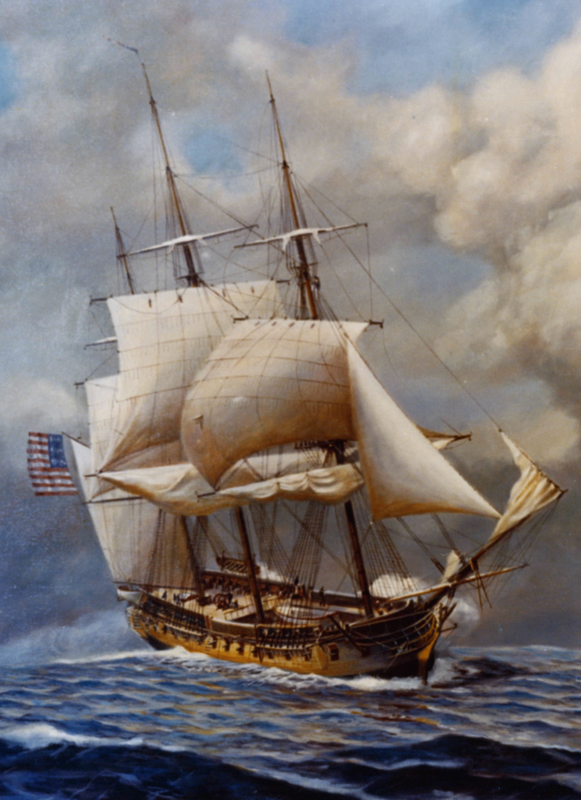 Another naval conflict with a French ship in 1800 – USS Constellation vs. La Vengeance – gained national attention and created legends for fledging sea-going force. 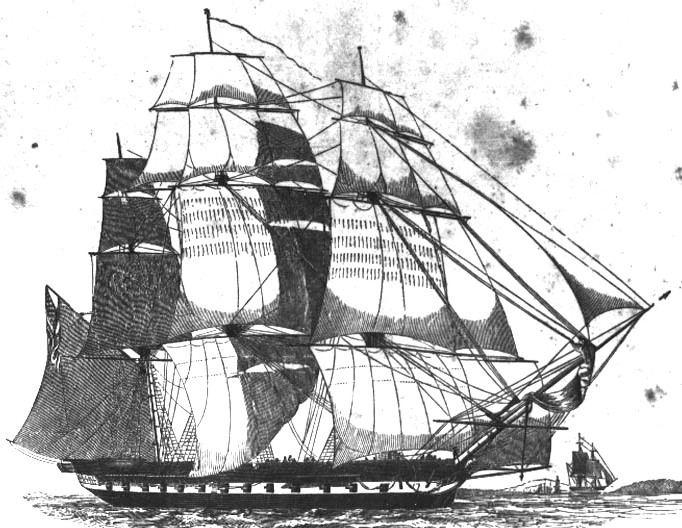 In the 1840’s, Constellation was the flagship of the East India Squadron which looked out for American trade in the Pacific and far east. 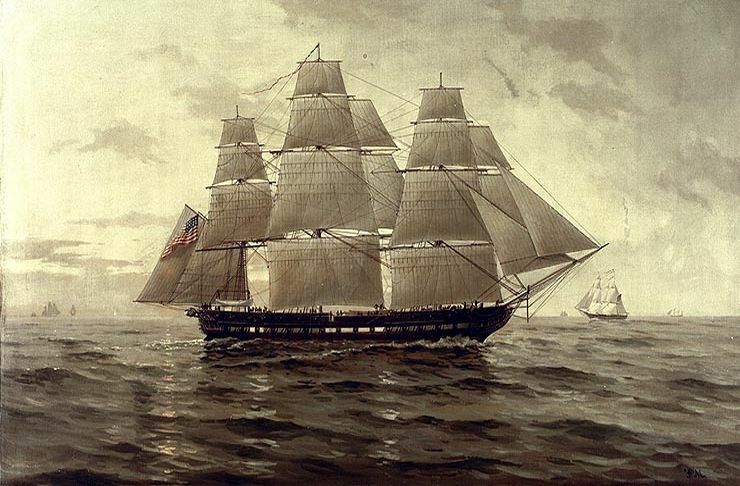 In the end, Constellation was scrapped at the navy yard in Portsmouth, Virginia, in 1853; many of her parts – possibly including her keel – were used in new navy vessels. Want to know something really cool? U.S.S. 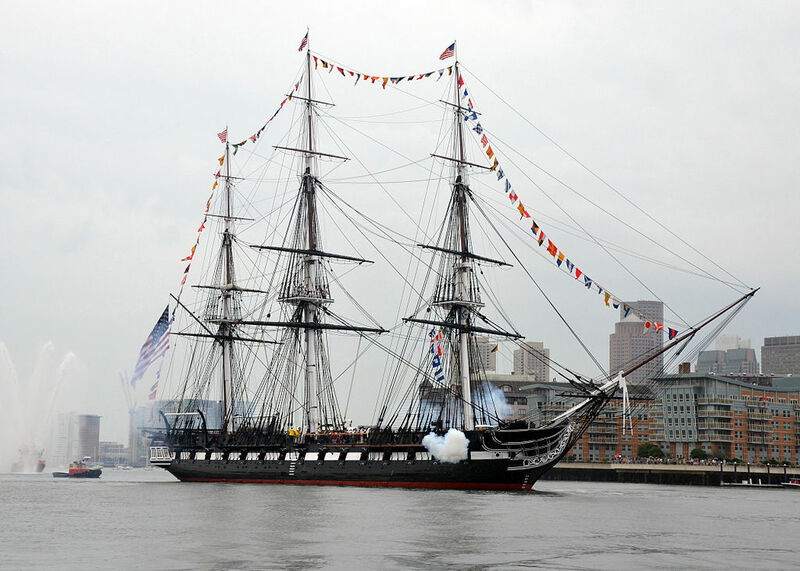 Constitution is the longest commissioned ship is the U.S. Navy – that’s right, she’s still around and still sails once a year in Boston Harbor! Launched in 1797 after construction in Boston, Constitution was built from approximately 60 acres of American forest, mostly oak. Though rated as a 44 gun frigate, the ship frequently carried over 50 cannon. Constitution guarded American interests in the Quasi War, First Barbary War (including the Battle of Tripoli Harbor), War of 1812, and internationally – Mediterranean Squadron, Pacific Squadron, and African Squadron. During the 1850’s, she was dry-docked as a training ship, but was re-commissioned at the beginning of the Civil War. Constitution was displayed at expositions and used as a training ship until 1900 when she was authorized for restoration as a museum ship. Constitution is better known by her nickname “Old Ironsides” – given because of the tough hull and siding which was effective defense in battle. Her most famous combats were during the War of 1812: Constitution vs. Guerriere and Constitution vs. Java. The ship’s maneuverability, speed, armament, and skill of captain and crew are legendary. Launched in 1800, President had a short and fascinating role in America naval history. At 175 feet and carrying between 50 and 60 cannon, this ship participated in the Quasi and Barbary Wars. In 1807, President fired on the HMS Little Belt on a dark night without clearly identifying the ship or signal flags. When the firing ending and both captains realized their mistake at dawn, President’s captain offered assistance, but the ships went their separate ways. With both American and British captains claiming that the other had fired first, their countries eventually let the affair go and chalked it up to the irritating incidents leading to the War of 1812. During the War of 1812, President engaged in numerous naval combats. The war’s end wasn’t happy for the ship and crew. On January 15, 1815 – technically after the Treaty of Ghent ended the war – President tangled with a small British squadron and was forced to surrender. The British took the ship as a prize, briefly renamed it HMS President, and then scrapped the vessel. Like her sister ships, Congress participated in the Quasi War, Barbary War, and the War of 1812. She was built in New Hampshire, launched in 1799, and sailed with between 38 and 44 cannon. Congress was instrumental in the Pacific and was the first U.S. Navy ship to visit China. The ship remained in service until 1834 when it was scrapped. Launched in 1799, Chesapeake carried between 38 and 50 guns, varying the number on different cruises and missions. Built in Norfolk, Virginia, she was the smallest of the first six frigates. Chesapeake participated in the Quasi and Barbary Wars, but her most famous military actions were leading up to and during the War of 1812. The Chesapeake–Leopard Affair occurred in 1807 when the British captain of the Leopard insisted on searching the American vessel for deserters; when the American captain refused, Chesapeake received broadsides from Leopard. The incident outraged American citizens and is generally considered a major stepping stone toward the War of 1812. The Chesapeake – Shannon Affair took place in 1813. In the conflict, American Captain Lawrence ordered “Don’t Give Up The Ship” which became a navy motto. The ship duel resulted in the Chesapeake‘s capture; she became a British prize – HMS Chesapeake. The British considered the Chesapeake an “unlucky” ship, but were impressed with her speed. However, in 1820, they broke up the ship and sold the timbers.